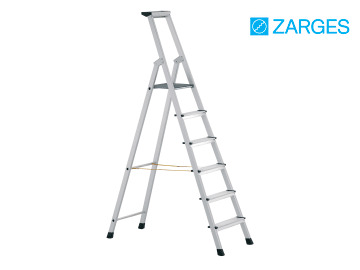 The Zarges Anodised Trade Platform Steps have 80mm deep treads to allow standing without fatigue. 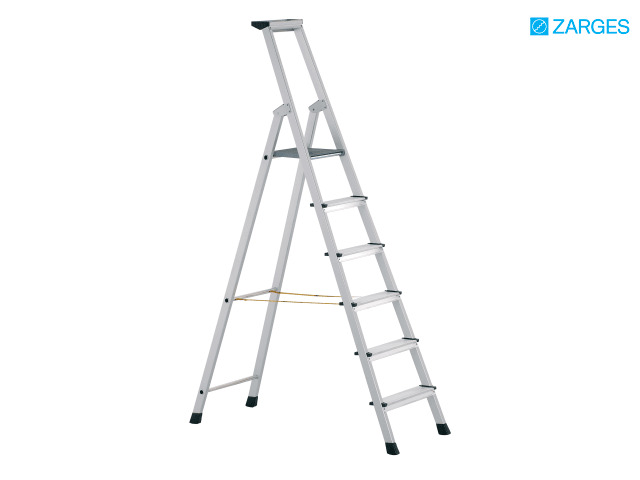 A solid safety platform of diecast aluminium measures 250mm x 250 mm, and the ladder is supplied with a spacious aluminium storage tray for materials and tools. Triple riveted connection between treads and stiles ensures strength and durability, and non-slip plastic end caps improve safety. The treads and stiles are made from extruded aluminium sections. Two high-strength Perlon belts prevent splay, are fitted on all models of 4 rungs or more. Stile depth steps / back stay: 48 / 42mm.